The Provincial Parent Association Advisory Committee on Special Education Advisory Committees (PAAC on SEAC) was established in 1983 and is the only group in Ontario that brings together provincial parent associations to communicate and co-operate on issues pertaining to SEACs. PAAC, and its member organizations, encourage valuable partnerships among trustees, educators, voluntary associations and parents. 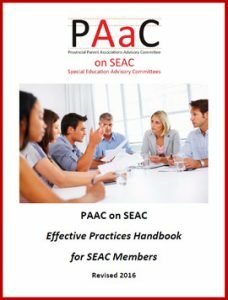 PAAC on SEAC members have been working closely to improve SEAC effectiveness and communication, and to assist Ontario’s students with special education needs through our shared advocacy. The three new video training modules, and updated Handbooks are available on the PAAC on SEAC website and YouTube Channel. PAAC on SEAC members also met three times this year with Paul Grogan, Education Officer, SEPPB, who is the liaison for PAAC on SEAC at the Ministry. At the meetings that Paul attended be provided updates on the meetings of the Minister’s Advisory Council on Special Education as well as the Special Education Updates provided by the Ministry. David Lepofsky, Chair of the Accessibility for Ontarians with Disabilities Act (AODA) Alliance, presented on the need for an Accessibility Standard on Education directed at eliminating barriers in our education system (including post-secondary, pre-school, and job training programs). PAAC on SEAC heard from a number of SEACs with concerns about how SEAC is involved in the development of the annual Special Education Plan. The discussion raised questions about who the target audience is for the Special Education Plan (Ministry, parents, general public) and how to make the information easy to read and understand by parents. PAAC on SEAC heard from SEACs that are concerned about the negative impact of the new special education funding model on some school boards, especially those with relatively small special education budgets. Members of PAAC on SEAC agreed there is a need for continuous information-sharing about and evaluation of the special education funding model to meet student needs across the province. Announcement in the March 2016 budget of $17 million in funding to support the Special Needs Strategy, through the hiring of Service Coordinators. Release of the Program Guidelines for the Integration of Rehabilitation Services, including occupational therapy, physiotherapy and speech-language pathology services. The Program Guidelines, and the Special Need Strategy, are intended to improve services for families and to make it easier to navigate the system. Work is on-going and is still not clear how services will change or impact the school system. In May 2016, the Provincial Advocate for Children & Youth released a report from the We Have Something to Say Consultation: We Have Something to Say: Young people and their families speak out about special needs and change. The report highlights the request from youth to have a say in how services for young people with special needs are developed, and especially in the planning for their personal care. This report provides a few of the highlights of the activities of PAAC on SEAC in the past year. For more information about PAAC on SEAC please check the website or contact the Co-Chairs at info@paac-seac.ca. A list of PAAC on SEAC members is shown on the following page and new members are welcomed.